Hotlinking(except for our logo affilation link) as well as all translated articles posted on S.H.E 911 Daybook are not to be extracted elsewhere unless approved by us. Interested in advertising with us? Please CONTACT US to find out more! 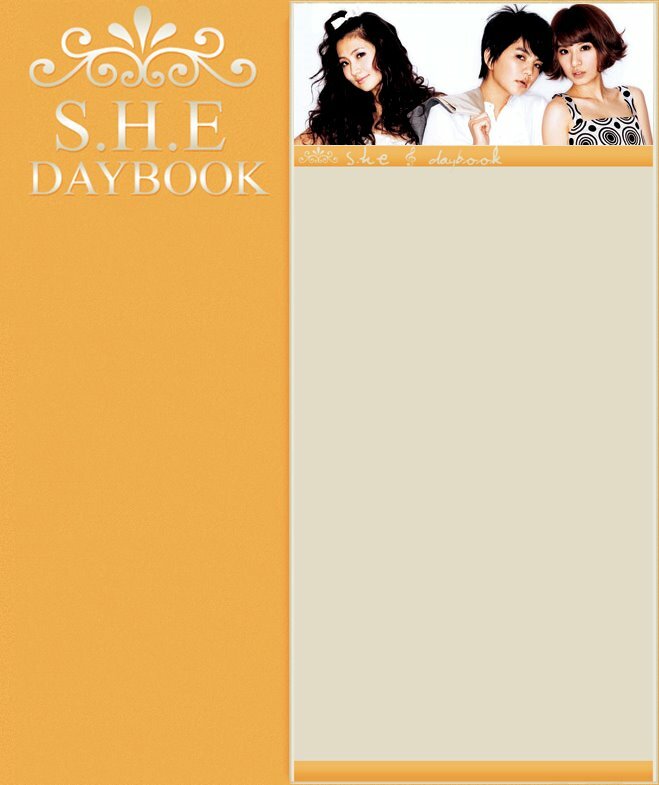 S.H.E Daybook was officially opened by it's very owner on Thursday, 2nd February 2006. Creating and supporting the whole site single-handed, hardwork has been seen by countless of fans with hundreds of visitors each day. S.H.E Daybook is considered as a mini site which does not hold the capacity and the need of registered users of those who have provided forums thus every activity held here is very limited yet 100% wholeheartedly. What does S.H.E Daybook provide? Our main purpose we wish to acheive is to pass S.H.E's blog messages to all non-chinese speaking fans. On occasions when time allows, S.H.E related news would be translated. How can I trust S.H.E Daybook? Please be assured that all messages translated by us are 100% original messages posted by S.H.E. S.H.E Daybook will never provide faux messages or information. S.H.E Daybook 是在 2006/2/2 正是開始的. 獨立自主創造S.H.E Daybook 的主人的辛苦及決心已被無數的S.H.E歌迷看到了, 每天至少有幾百人上 S.H.E Daybook. S.H.E Daybook 也不需要大家註冊所以 S.H.E Daybook 的活動總是 有限. 當然! 請放心, 我們所反應的S.H.E留言都是100%真正的. S.H.E Daybook 絕對不會提供假留言.